Although no longer produced in RHD (right hand drive) form, the launch of the new Setra S 531 DT Double-deck Top Class 500 will be of interest to Irish operators, because many of the safety features available on this luxury coach can be supplied and fitted on the sister brand’s Mercedes-Benz Tourismo and other offerings from the Daimler Group. At a special demonstration for the specialist trade media by Setra’s technical team, the various activities provided a good and effective insight of two main features – Active Brake Assist (version 4) and Sideguard Assistance. One of the most danger prone manoeuvresfor a truck or bus in relation to pedestrians or cyclist is making a left turn, for right hand drive vehicles. 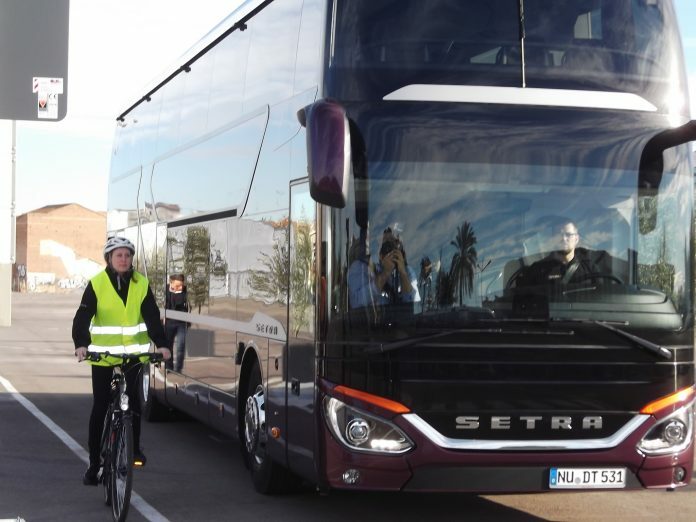 It is indeed a busy and challenging time for any driver as he/she must watch for pedestrians and cyclists that may not always be visible to them or may not be aware that the coach is making a left turn. Sideguard Assist removes a lot of this stress for the driver and will dramatically improve safety for pedestrians and in particular cyclists. The system works in a number of stages. Using a radar beam, a moving object such as a cyclist is detected. At this point the driver may not be aware of the cyclist and so to warn him/her an orange light illuminates on the right-hand mirror and on the dash. If the distance is reduced, the warning light changes to red and starts to flash very fast. In addition, the driver’s seat will start to vibrate. Furthermore, if the driver selects the left indicator or turns the steering to the left, this will activate the warnings. There is also a function for detecting stationary objects such as traffic lights, traffic bollards or parked cars. Using the information from the steering and the radar beams an alert comes to the driver if the turning angle looks like it will cause a collision.